The Weyns's Weaver Ploceus weynsi male has a black head, back and breast and pale eye. 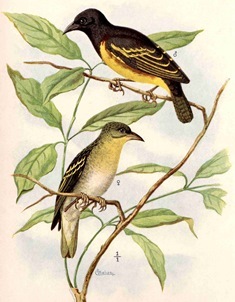 It is similar to Vieillot's Black Weaver, but the rest of the underparts are chestnut and yellow, and the wings have a yellow wing-bar and feather edgings. The female has plain olive-green upperparts and face, with a pale eye but no supercilium. The female is separated from very similar female Vieillot's Black Weaver by a blackish bill, green tail and yellow underwings. The Weyns's Weaver is found in eastern PRCongo, western and northern DRCongo, southern Uganda and NW Tanzania (see map below, based on Birds of Africa). There are no subspecies of the Weyns's Weaver. The Weyns's Weaver lives high up in tall forest trees in seasonally dry swamp forest, and also in lush lake shore vegetation. It is restless, with a fast flight. It is usually resident, but may wander erratically, and seems to be absent from the northern shores of Lake Victoria in June-Sept. The Weyns's Weaver feeds on fruit, including wild figs, and most likely is also insectivorous. It forages in pairs and in flocks, mainly in the forest canopy. Feeding flocks are about 20 individuals, and sometimes up to 200 or more. It roosts in flocks, sometimes with other weavers. There is very limited information on the breeding biology of the Weyns's Weaver. There is one record of breeding in a papyrus swamp in Mabamba Bay, Uganda, in February 2006. This resembles the breeding pattern of Clarke's Weaver. One photo of the nest of a Weyns's Weaver, however, is in a tree in Bwindi Impenetrable National Park, Uganda (see here). There are no PHOWN records for the Weyns's Weaver yet (see PHOWN summary) - be the first to find its nest! Submit any weaver nest records to PHOWN (PHOtos of Weaver Nests) via the Virtual Museum upload site.